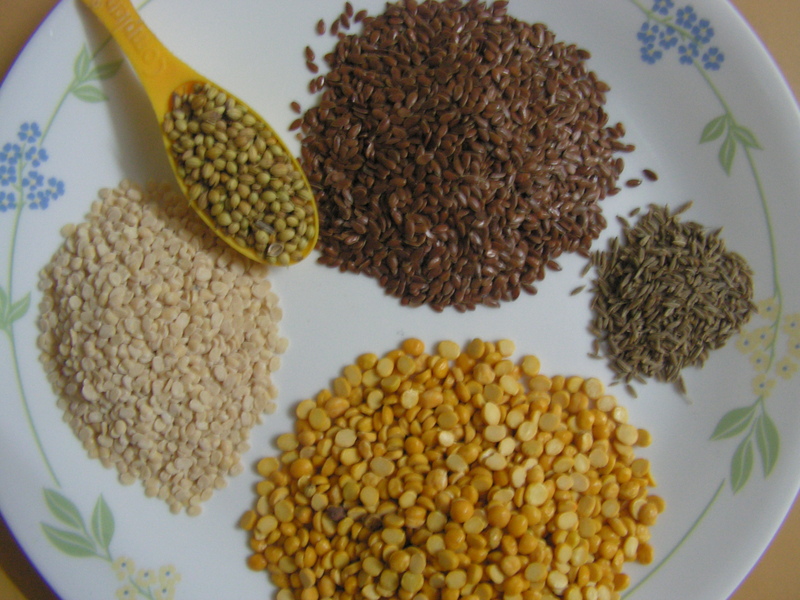 Alsi seeds/Flax seeds in English and Agase beeja in Kannada Is known to its medicinal value. 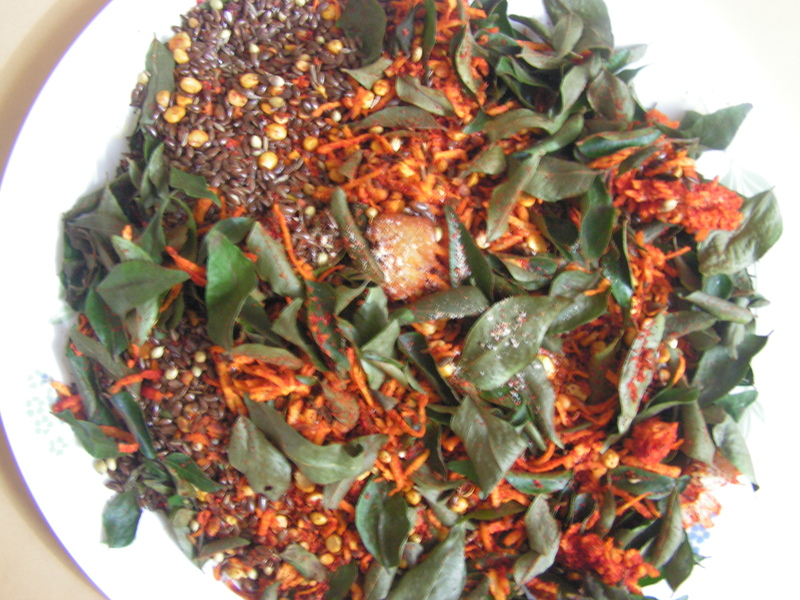 I have already put up Alsi seeds chutney powder which was well-received. 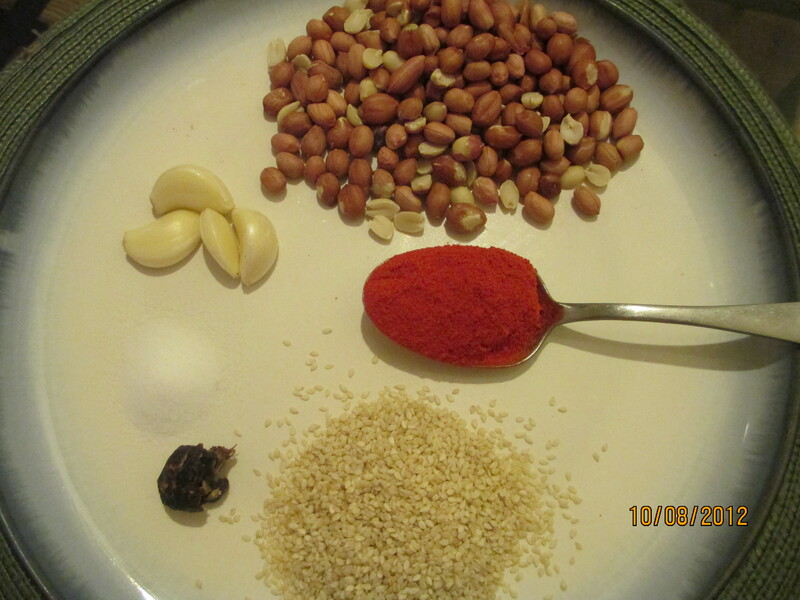 So as a change I tried a simple version of that recipe but with additional ingredients, namely peanuts and garlic. 1. Wash and drain flax seeds and dry roast it on medium flame till it splutters. 3. 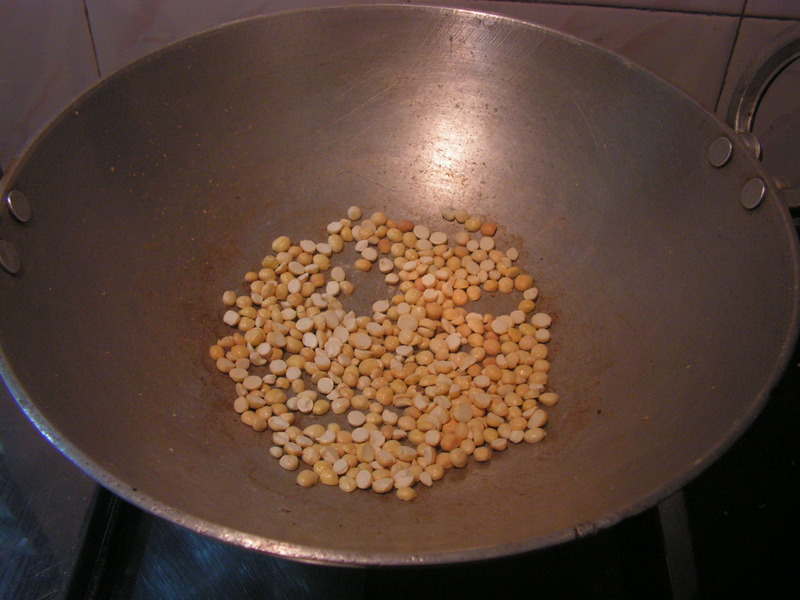 Place a skillet with dalia dal in and dry roast it till it turns crispy but does not change the color and also not burn. 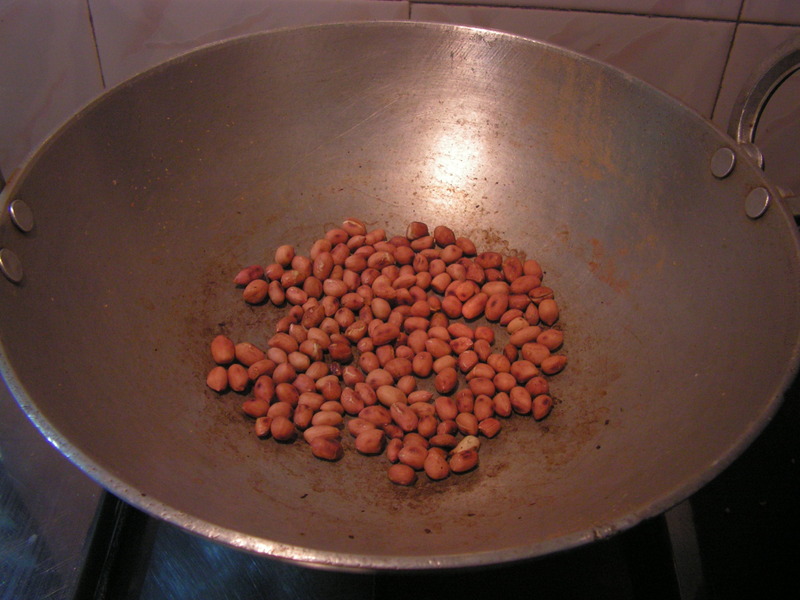 In the same skillet dry roast peanuts till one is able to peal it also you get a pleasant aroma. 4. 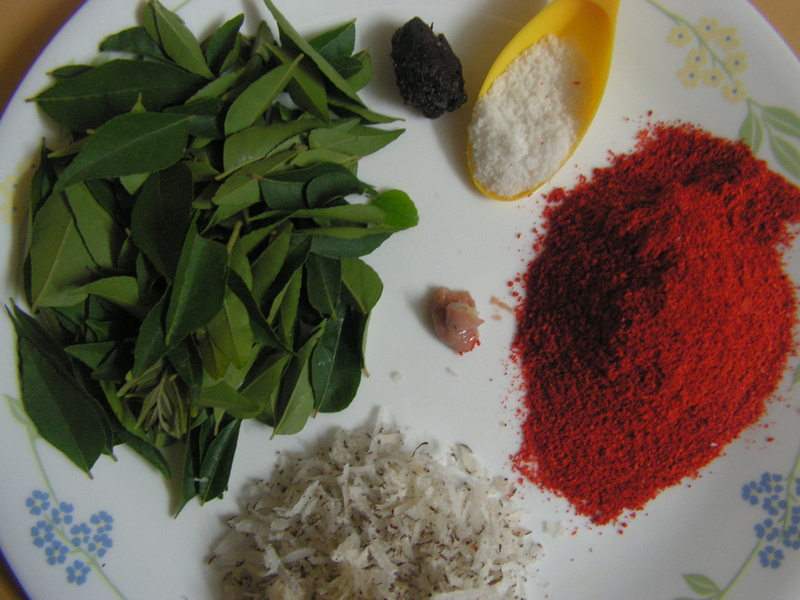 Wash and pat dry curry leaves and dry roast the same till crispy but not change the colour. 5. Dry roast grated copra till crispy till the colour turns to light brown. 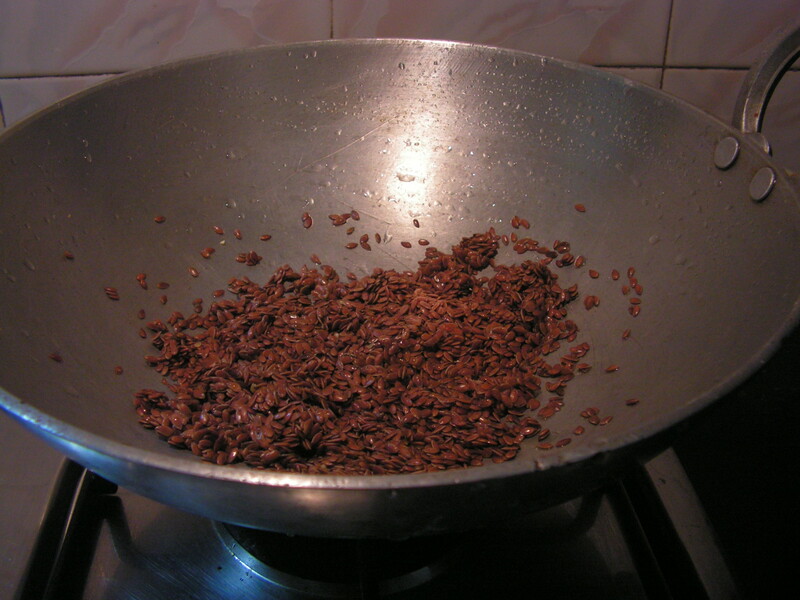 Switch off the flame add chili powder and place the tamarind a midst the hot mixture so as to soften the tamarind. Stir occasionally. 6. 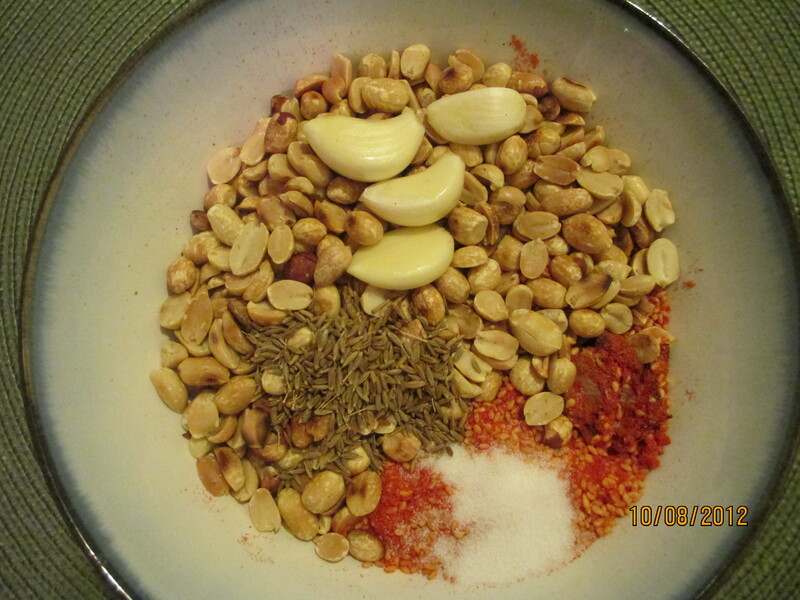 Transfer all the roasted ingredients into a bowl including garlic(raw) salt and sugar. 7. 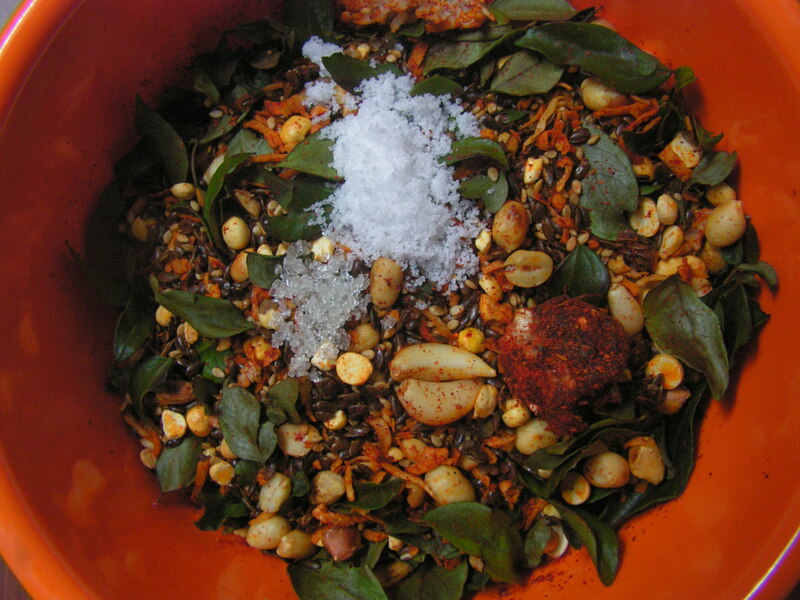 Transfer the above chutney mix to a mixi bowl and grind it to a medium coarse powder. Check for salt and add if needed. Transfer it to an airtight container and enjoy with roti, chapati, dosa, idli, bread sandwich, or anything else. 1. 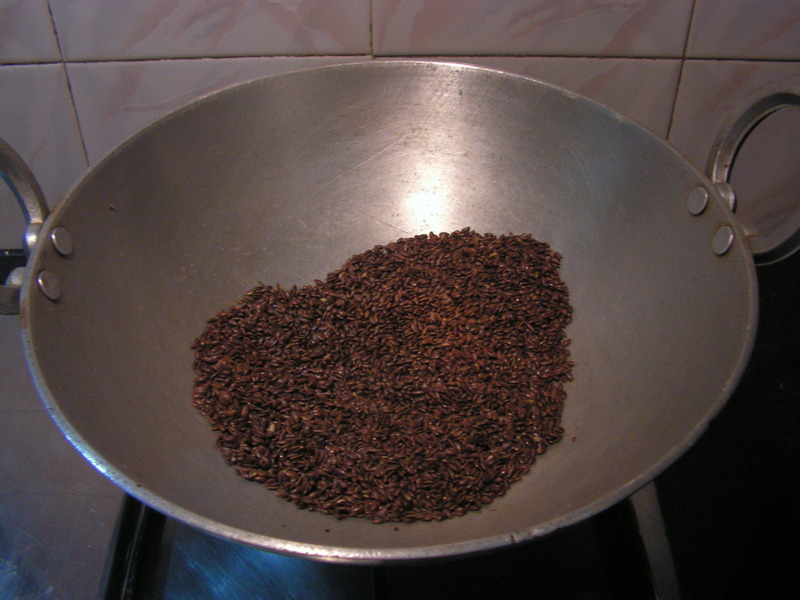 Always wash flax seeds, sesame seeds, curry leaves for better results before roasting. 2. 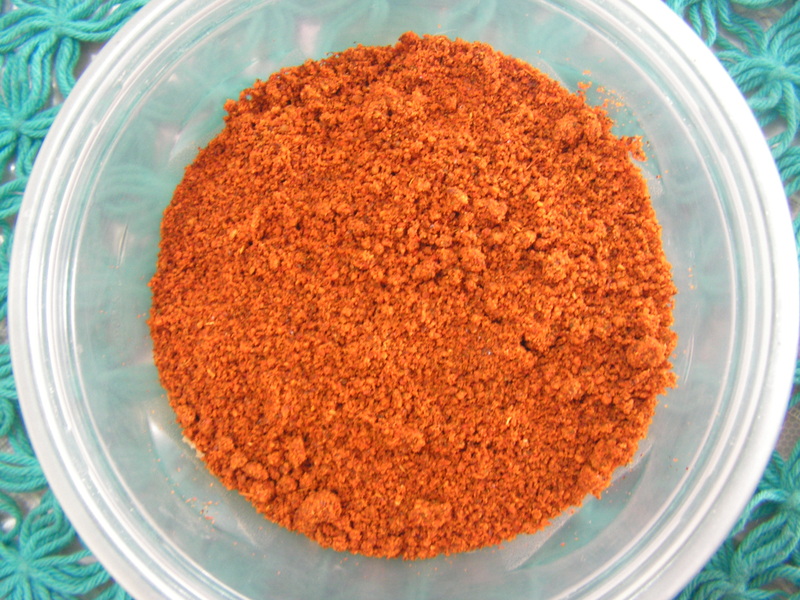 One can change the quantity of chili powder as per one’s pallet. 3. Sugar actually gives a unique flavor to the powder. So I would actually recommend it. This entry was posted in Uncategorized and tagged Dry chutney powder, rice, Side dish for Roti. I am used to trying out new combinations for chutney powders as it is the best substitute to the regular wet chutney prepared at home. This was one such thing and it turned out well enough that it can go into the long list of Dry chutney powders on this blog. Off we go ! 1. 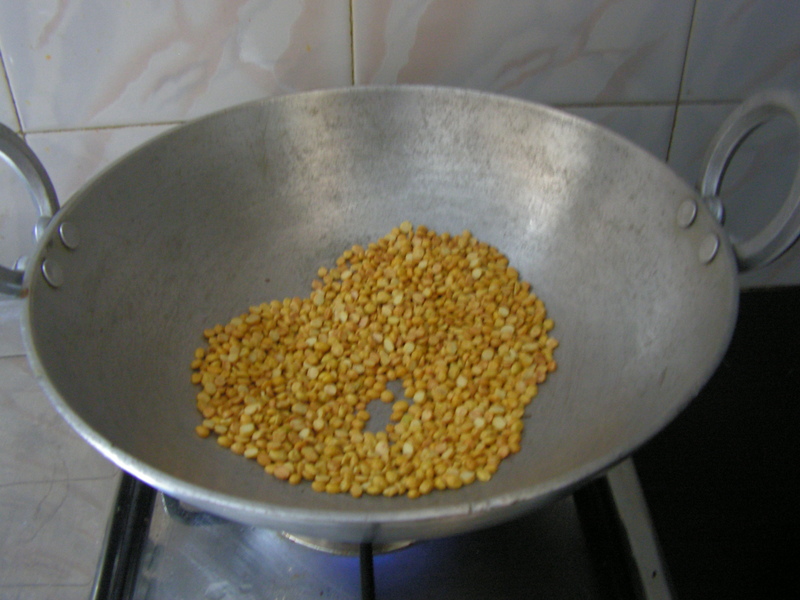 Place a skillet and dry roast peanuts in it till you get a pleasant aroma andon cooling peal it and keep it aside. 2. 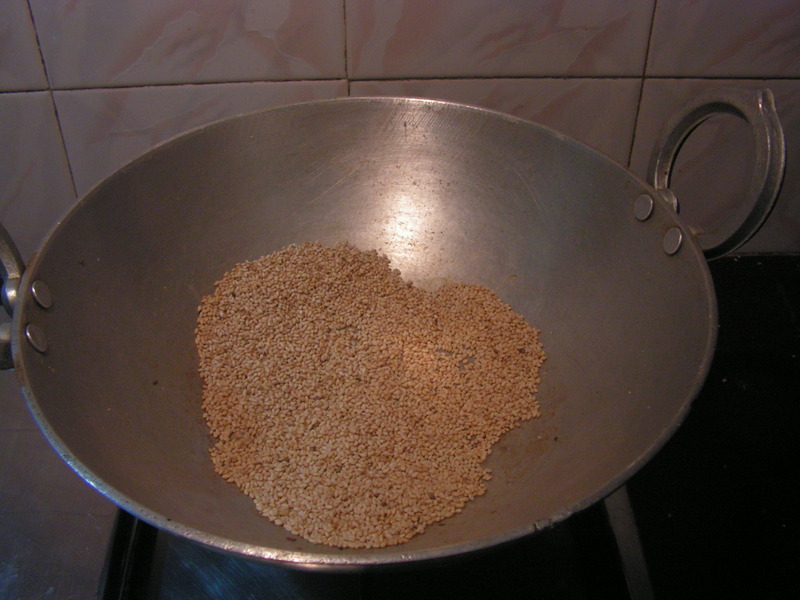 Wash and dry roast sesame seeds in the skillet till it splutters and keep it aside Just mix chili powder to it when it is hot and stir it. 3. Transfer all the roasted and other ingredients to a bowl including pealed garlic pods, tamarind, salt and cumin seeds(raw). 4. 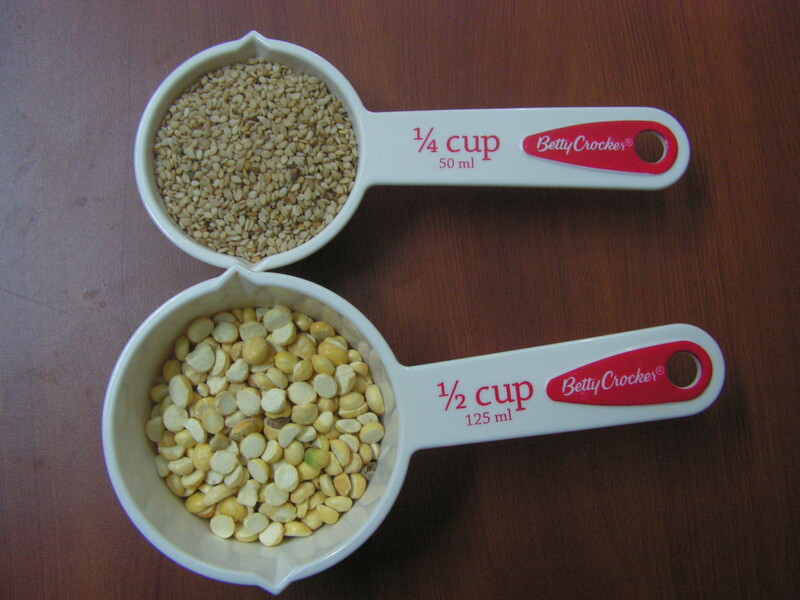 Grind the above ingredients in the dry grinder to a medium coarse consistency.On cooling store it in dry and air tight containers and use dry spoons always for serving too. Enjoy with rice and dal, idli, dosa and parathas. A healthy chutney powder indeed!!!!! 1. 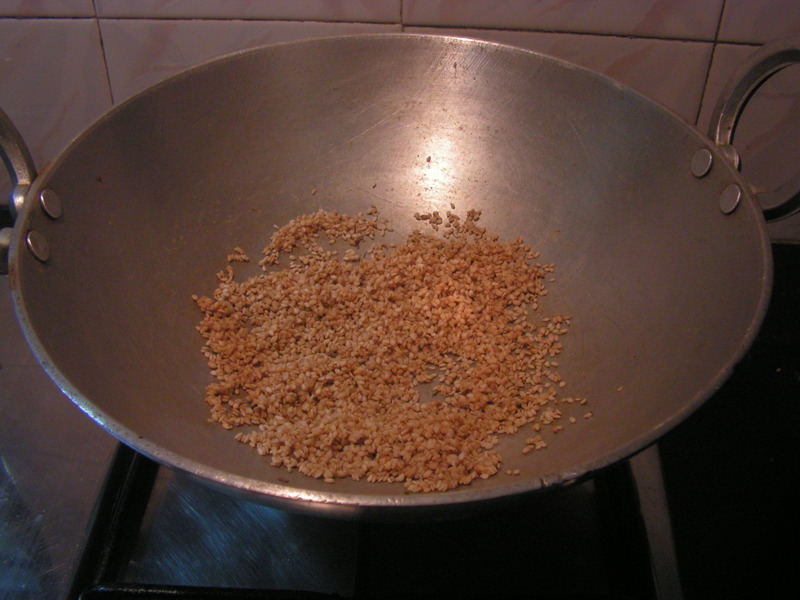 Always wash and then dry roast sesame for it to splutter well since if it does not splutter there is no aroma and will be raw. 2. As there is no copra it is relatively healthy too with raw garlic and cumin for digestion and aroma. 3. 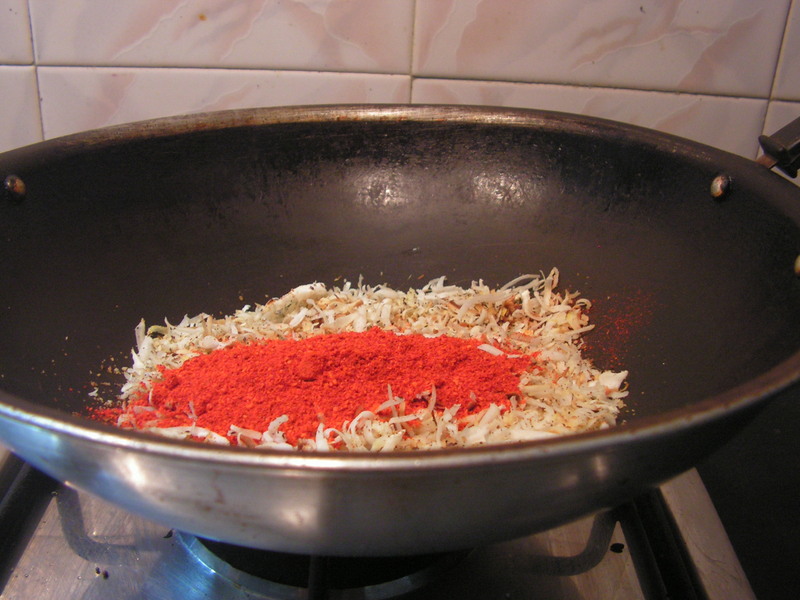 There is no need to separately warm up chili powder as when sesame is hot just pour it into the same skillet and stir in. This entry was posted in Uncategorized and tagged Dry chutney powder. 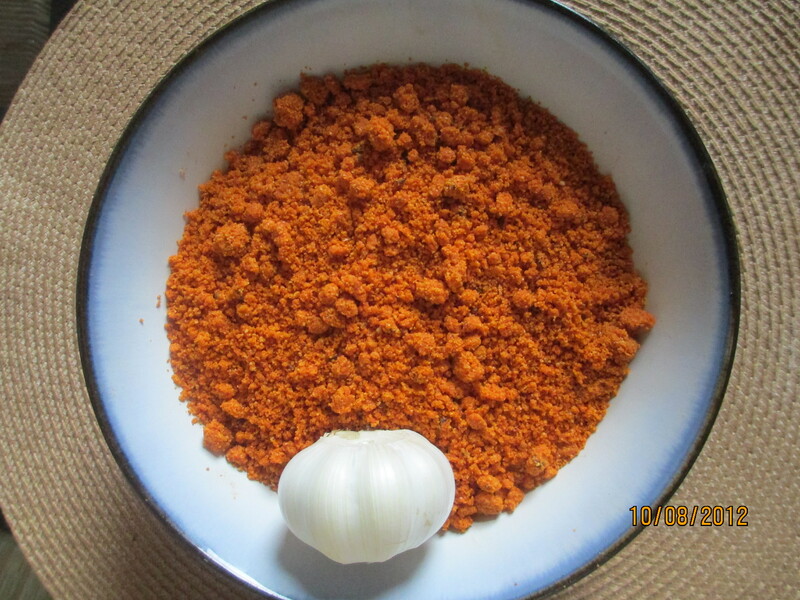 Today I would like to put up Niger seeds chutney powder and that make it the sixth variety of chutney powders on this blog ! 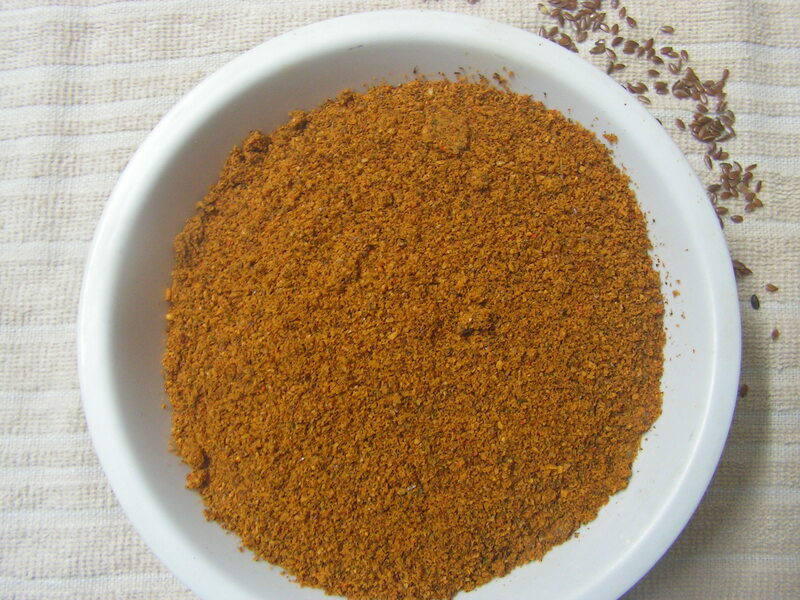 People enjoy this powder, much like other powders, with Jwari roti and chapathi. 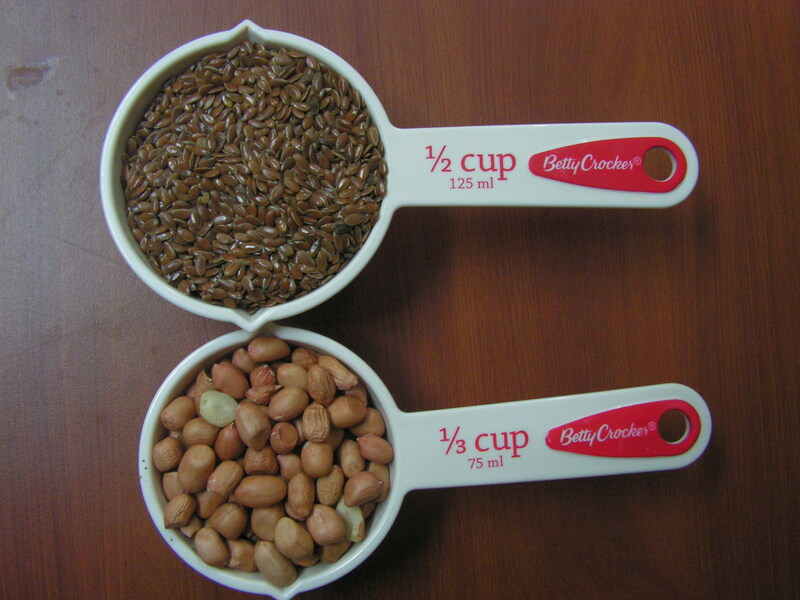 Niger seeds in English – that is Uchellu/Gurellu in kannada. 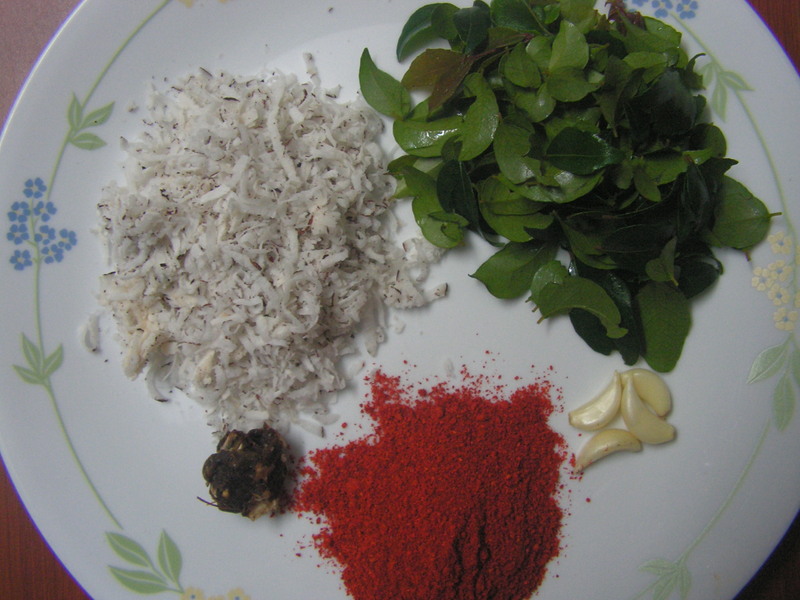 These seeds are used in masalas by the people of North Karnataka. They resemble the black cumin seeds but are soft and slippery. It is an eseential ingredient in most curries and especially in the masalas for Yengai – Masala stuffed in Egg plant/Brinjal. Their importance is similar to the use Peanuts in the Masalas from Maharashtra and coconut in Southern Karnataka. 1. 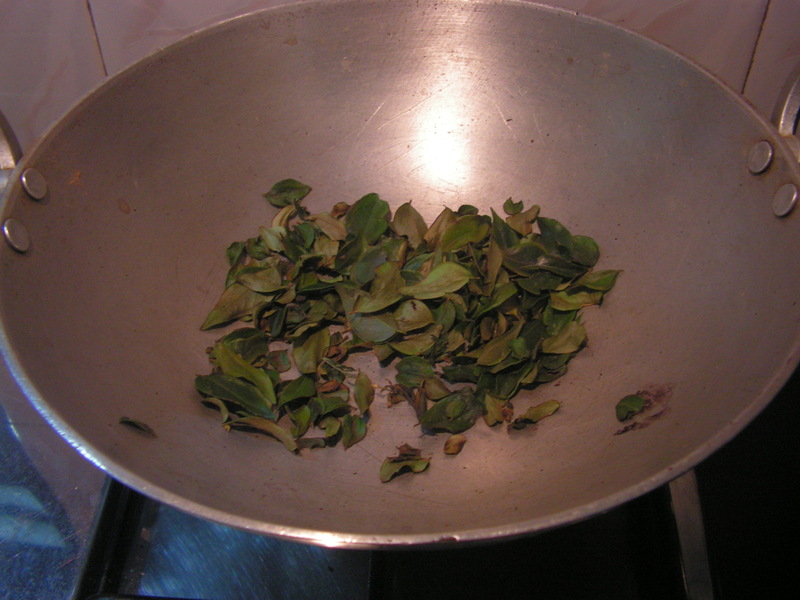 Grate dry copra, wash and chop coriander leaves fine. Peal and crush garlic pods a bit and keep aside. 2. 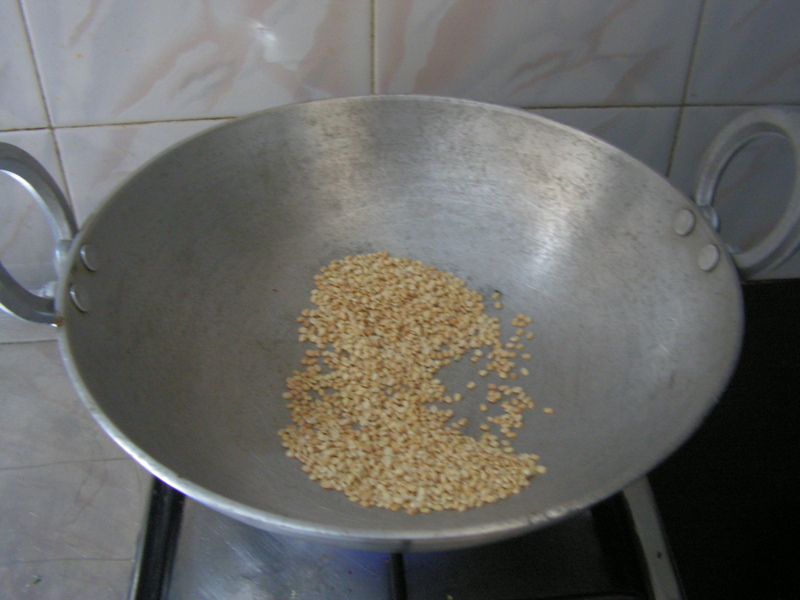 Place a wide bottomed bowl on medium flame and add chopped coriander leaves. Keep stirring till it turns a little dry. 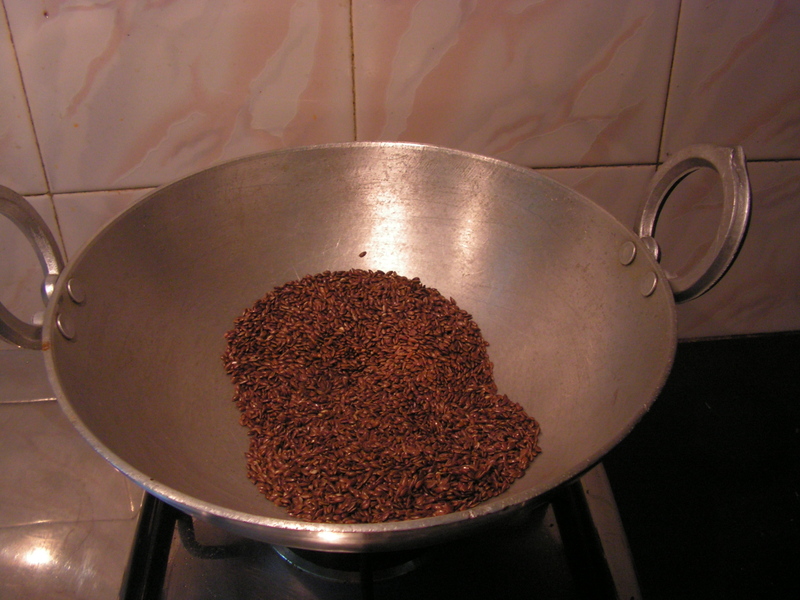 Now add Niger seeds into it and keep roasting till it splutters and the color turns a little dull. By then even coriander leaves will have also roast. Transfer it into another bowl to cool. 3. In the same wide bowl dry roast grated copra from step 1 till it turns crispy and a little brown. 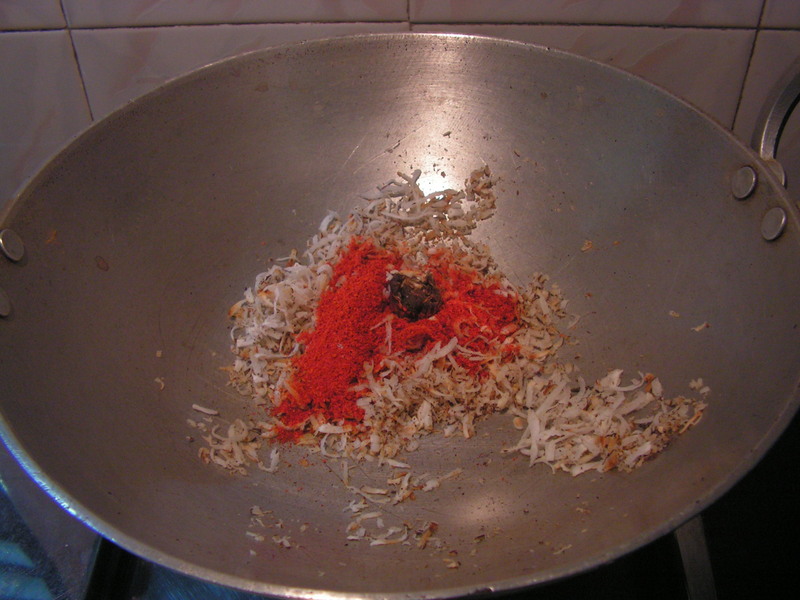 Switch off the flame and add chili powder, tamarind and salt to it. 4. On cooling mix all dry roasted items from step 2 and 3 into a bowl and add crushed garlic pods to it. 5. Dry grind the ingredients in the mixer to a medium coarse consistency. Enjoy it with Jwari roti or Chapathi with an onion round ring!!!! On cooling store it in dry containers so it remains afresh for more than a month. This entry was posted in Uncategorized and tagged 45 minutes, Dry chutney powder, Dry powders.